Whether it’s your first time in San Francisco or you recently moved to the city, here are a few spots EVERYONE must see. And if you’re like me, you like to avoid all the touristy spots. 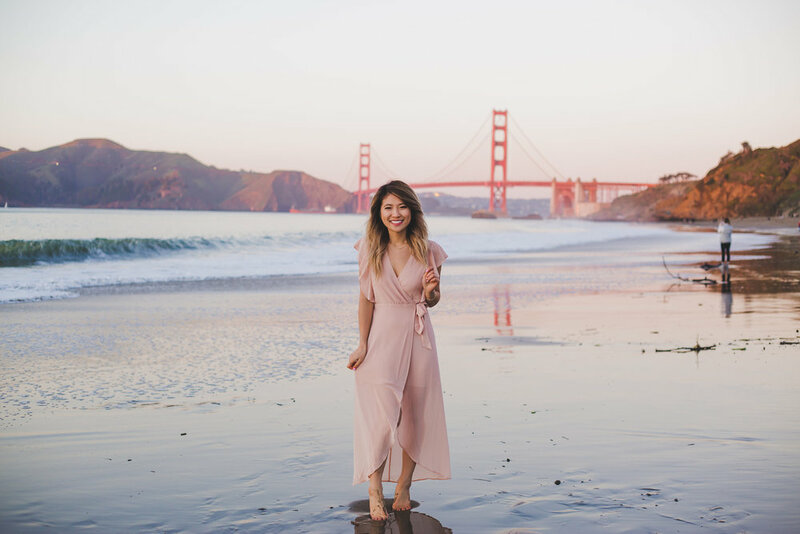 Here are some of my favorite places in San Francisco to take photos and have the perfect day. Hands down the best view of the Golden Gate Bridge is from Baker Beach! I always take my friends and family from out of town to this little hidden gem. It’s tucked away from the tourists, generally more quiet, and has a great view of the bridge. On a rare sunny day, enjoy an al fresco lunch at the Conservatory of Flowers! Grab your picnic blanket, wine, and cheese. Don’t forget to bring your furry friends! We were lucky to find the Dahlia Garden in full bloom between September - October. One of my most frequently asked questions is, where can I go shopping in San Francisco? Well, I personally love browsing the boutique shops on Union Street in the Marina. You can find unique clothing, jewelry, and artisan crafts. Grab a bite to eat at Rose’s Cafe and coffee from Wrecking Ball. Okay, okay, I promised you guys I wouldn’t talk about anything TOO touristy. Well, the Painted Ladies is a big tourist attraction but you can actually find a lot of locals here too. Alamo Square is located in Hayes Valley (another one of my favorite neighborhoods). The park is dog friendly so you will find a lot of furry creatures roaming the grassy hills. Plus, you can see an awesome view of the city behind the Fuller Houses. Have you ever seen these rainbow sidewalks in your favorite San Francisco Instagrammer’s IG Stories?! I bet they were on their way to Soul Cycle… On the corner of 16th and Castro, you can find these famous colorful sidewalks! Please beware that this area is very crowded and full of people. Last week, I had an awesome lunch date with Alyson, SF Beauty Blogger of The Beauty Vanity! Since she is on the Keto diet, we wanted to try a healthy matcha cafe. We really enjoyed the ambiance of Stonemill Matcha and the experience of walking along Mission Street. Around the corner you can also find my favorite flower shop, Ampersand. Thank you so much for reading! I hope you have a wonderful time in San Francisco!